Graava uses�a light sensor, image sensor, a pair of microphones, gyro sensor and accelerometer, all of which are used to select the keepers from your�footage. For example, if the wearer speeds up rapidly, the software will assume that indicates a notable moment and will include that scene in the resulting final video. Optionally, the user can wear a Bluetooth heart rate sensor that connects to the camera to help�identify exciting moments when the wearer’s heart rate is elevated. At the end of a shooting session, Graava uses a Wi-Fi connection to edit and upload your footage to the cloud. The video can be shared from the mobile app. 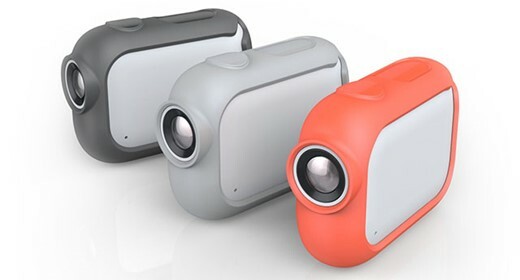 Videos can be recorded in either Full HD 1080/30p or 720/60p and�8 megapixel still image capture is also available.�The camera can be�charged by way of an optional�wireless charger, and can act as a security camera for in-home use.�With wireless communication turned off, the camera can record in Full HD resolution for about 3 hours per charge.�Other features include an IP67 water resistance rating, which is enough to protect the camera in rain and from accidental submersion, as well as a microSD card slot, micro HDMI, an integrated speaker, and two camera status LEDs. The app is available for both Android and iOS. Graava will begin shipping in the first quarter of 2016. The camera is available for pre-order now for $249 until September 1, after which point it will be priced at its regular $399 retail rate. The company will take pre-orders globally, but doesn’t list foreign pricing. Gravaa will ship to locations in the US for $20, and to all other locations�for $30 for a single camera.